I will probably only be getting one more Foodie Pages Tasting Box after this one! How sad. 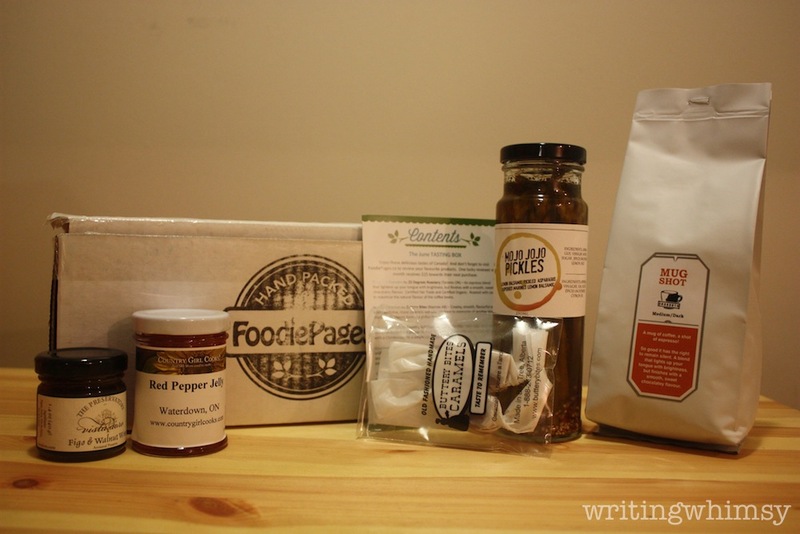 I’ll explain why at the bottom of this post, but first I’ll share the contents of my Foodie Pages Tasting Box June 2013. If you’re interested in checking out the contents of my May Box, click here. My box once again arrived at the beginning of the next month (July), extremely well-packed and full of goodies. 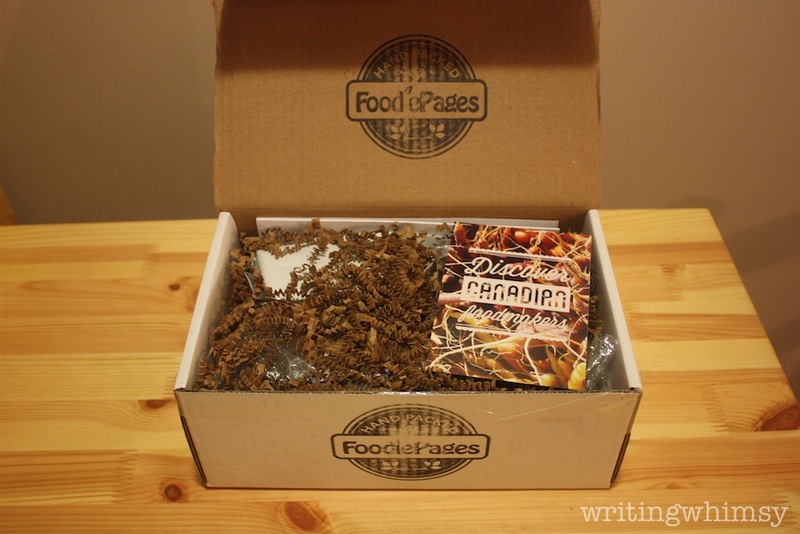 Foodie Pages provides spoilers of the upcoming month so I knew what to expect, and I was pretty excited even though this box wasn’t quite as perfect a fit as the first one. For $11, I decided to stay subscribed anyway. The box itself contained 5 different products from small batch Canadian producers, and this time they came from a variety of three different provinces. The Foodie Pages Tasting Box June included a contents card for the box like always, which tells where the products are from and what you can use them for. 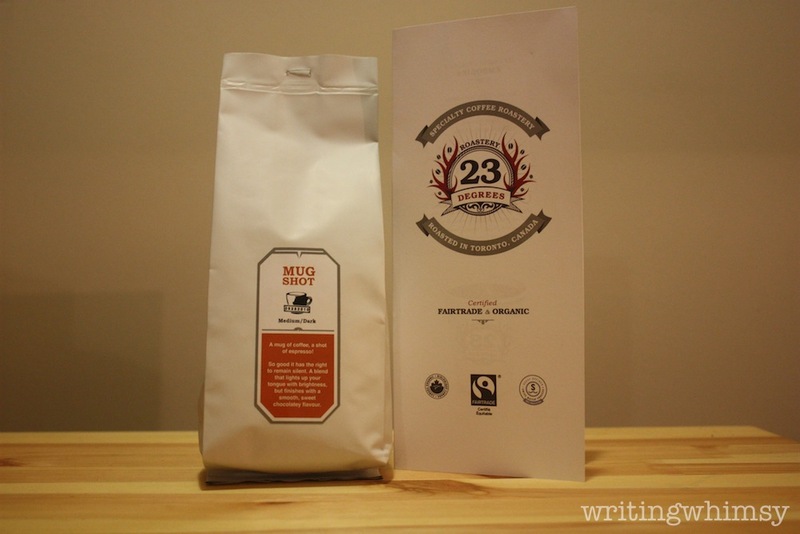 Mugshot Expresso by 23 Degrees Roastery (Toronto, ON)– An espresso blend that lightens up your tongue with brightness, but finishes with a smooth, sweet, chocolately flavour. Certified Fair Trade and Certified Organic. Roasted with care to maximize the natural flavour of the coffee beans. I like everything about this product except the fact that it’s coffee! It sounds amazing and the bag we received is a decent size but unfortunately I don’t drink coffee. My boyfriend does but we don’t have a grinder so haven’t been able to do anything with these beans at this point, I’m thinking I’ll gift them to my mom along with another item in the box when I see her this week. 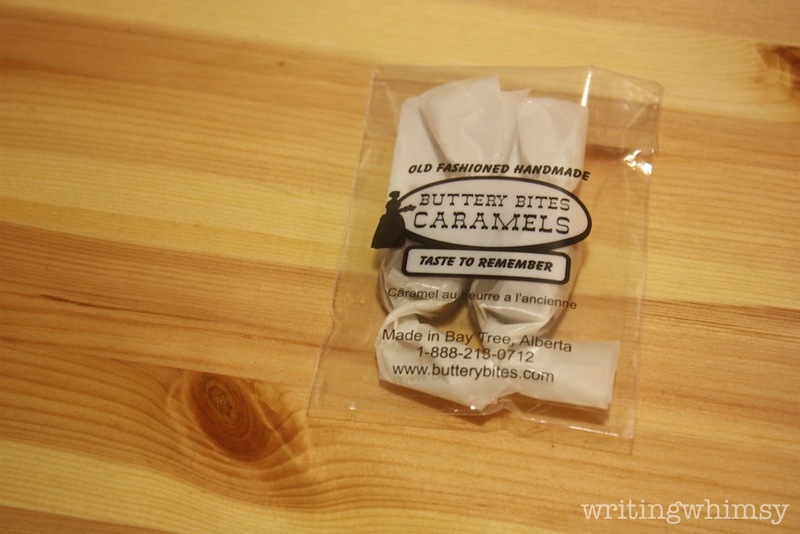 Vanilla Caramels by Buttery Bites (Baytree, AB)– Creamy, Smooth, flavourful and really addictive, these caramels will take you back to memories of another time. Made on the family farm in a gluten free facility. I am always up for sweets, especially when they are gluten free like hese are. They were packed right on top of the Foodie Pages Tasting Box June , like they were just waiting for me. They were melty and delicious with a hint of vanilla. I wish there were more! 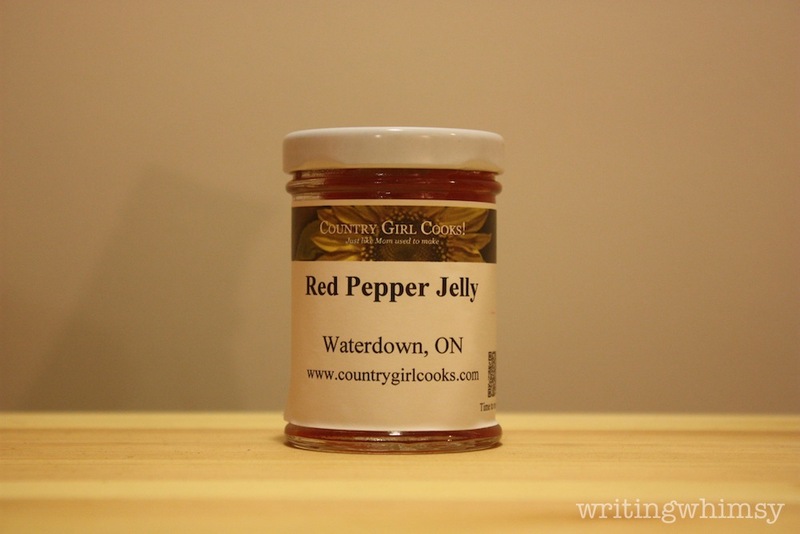 Red Pepper Jelly by Country Girl Cooks (Waterdown, ON)– Less sugar than most and a full-bodied red pepper flavour. Top your crackers with brie cheese and pair with a Cardonnay for a simple but elegant appetizer. I’ve never tried Red Pepper Jelly before the Foodie Pages Tasting Box June, but I’ll have to test it out with some gluten free crackers. I did grab a small taste of it and liked what I tried. These boxes are so much fun for trying something new that I never would have picked out on my own! 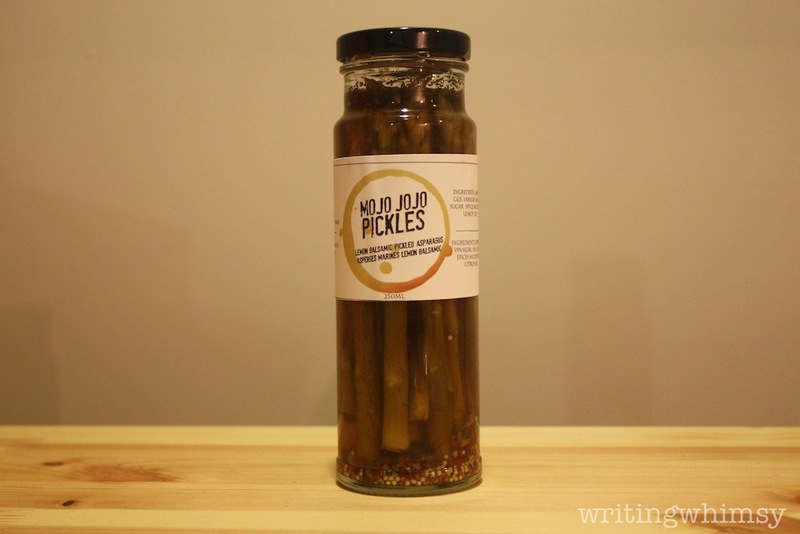 Gourmet Pickled Asparagus by Mojo Jojo Pickles (Edmonton, AB)– Flavoured with lemon balsamic vinegar and a blend of spices including mustard, dill, chilli, and a touch of lemon peel. It’s a sweet and tangy pickle that balances the bitterness of asparagus, perfect for grilling or as garnish in a Summer Caesar. This is the second item being passed onto my mom. I’m just not super into asparagus or at least not in pickled form although I am kinda curious and may steal a bit to try them out. The selling point for giving them to my mom was the label that says on the side “Pickles Yo Mama Don’t Make”– considering my mom actually makes pickles! Hopefully she likes these. I think this jar is also a decent size. 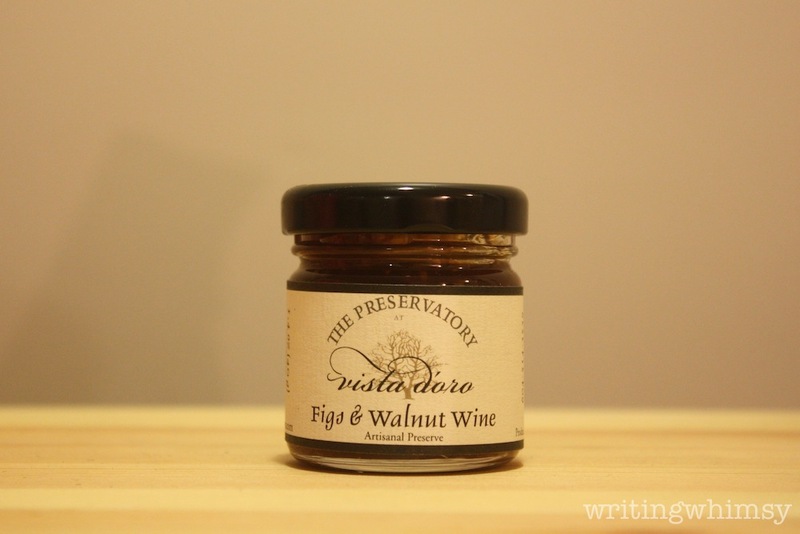 Turkish Fig with Walnut Wine Preserve by Vista D’oro Farms (Langley, BC)– Made using the vineyard’s signature wine- D’oro– a fortified walnut wine. Excellent with grilled pork tenderloin, blue cheese, or as a spread for a decadent chicken sandwich. This is a second spread-type item which I don’t really use, especially because I don’t eat bread, but I decided to save it anyway and maybe use it in a chicken wrap at some point. 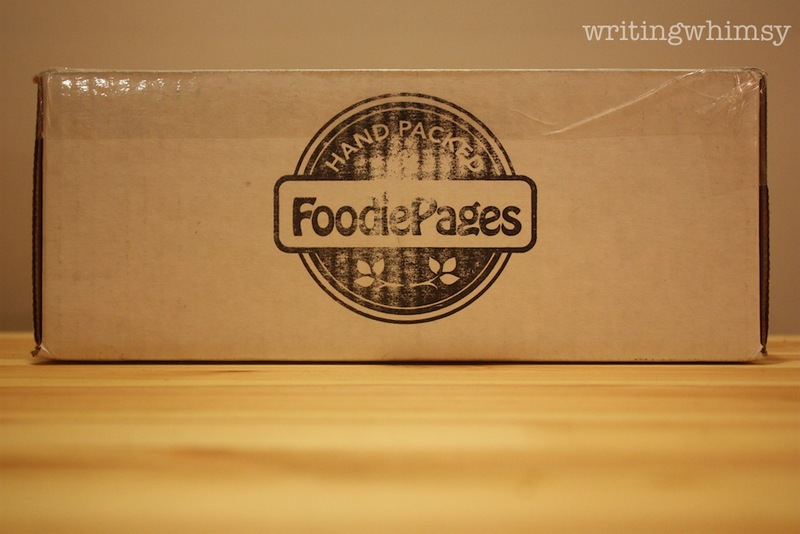 So yes, Foodie Pages Tasting Box June wasn’t a perfect match for my tastes, but I absolutely adore this box so why will I be saying goodbye after one more month? Believe me, it’s not my choice! The Foodie Pages Tasting Box is so popular, they haven’t had a single cancellation among their 50 subscribers. That means that there’s no way for anyone else to try it out, which is disappointing considering how I’ve raved about it and I know a couple of you have signed up and hoped to get a subscription. All subscriptions to Foodie Pages Tasting Box are going to be cancelled after the July box, and instead it’s going to be a single purchase item. Because the producers make small batches, they can’t increase the number of subscribers, but this way there is a chance for more variety and, if a box isn’t perfect for you (like this one for me) you can easily just skip it altogether. The boxes will go on sale on the 1st of each month, and I be they will sell out very quickly. I recommend subscribing to their mailing list to get a reminder, and if you’ll use my referral link I’d be very grateful! I will probably try for future Foodie Pages Tasting Boxes myself but after July I might give it a bit of time off and maybe try out another subscription. I guess I will see how it goes! I am disappointed to lose my subscription, but I understand where the company is coming from and hopefully in the future they maybe be able to offer more boxes. What do you think of the Foodie Pages Tasting Box June? How about the new system for the Tasting Boxes?